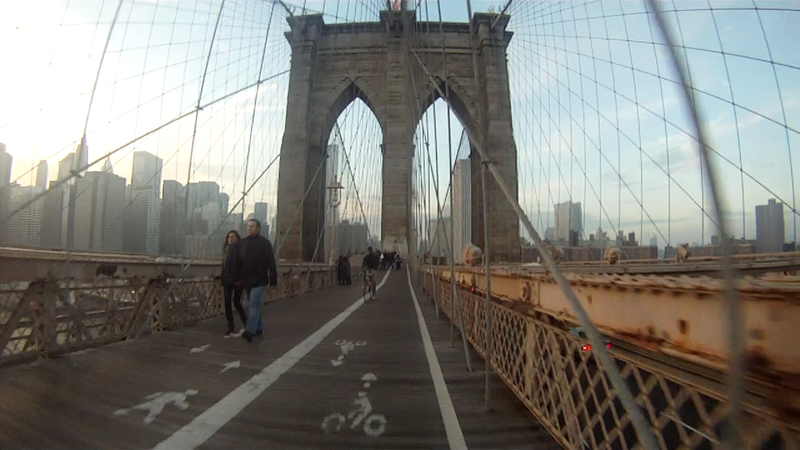 On Monday late afternoon I rode my bike across the Brooklyn Bridge and filmed it with a GoPro for you. Instead of the usual smooth moving GoPro look I messed with the footage until it got this "impressionist painting stop-animation" effect. "Riding across the Brooklyn Bridge" - In A Brooklyn Minute (Week 84) from Luci Westphal on Vimeo. First of all: the Brooklyn Bridge is still under construction. So sped up that footage 10x times - while the other parts before and after the construction are only 3x my biking speed. Before I get to the technical stuff: I LOVE the Brooklyn Bridge. I love walking across it, riding on it (if no one steps into the bike lane in front of me), driving over it, stopping for a drink, taking photos, taking a boat under it, gazing at it from Brooklyn or from Manhattan. I think walking across it is the absolute "must do" for anyone visiting NYC. It's a great way to approach the city - but also a lovely way to leave the noise and claustrophobia and people of Manhattan behind and cherish the wide open space on your way to Brooklyn. The driving song is "Bruce Lee" by Jason Matherne. Thank you to Sanity Productions for lending me the camera! When I first looked at my footage the result was nothing like I expected. It was a bit bouncy and had some issues with the rolling shutter. The GoPro was strapped to the handlebars of my bike. And the actual bridge part is made of planks of wood. The resulting footage is tremendously jerky. Not to mention that my handlebars swerve back and forth as I fight my way up the incline. Jerkiness wouldn't have been the worst but due to the CMOS rolling shutter situation, the image keeps getting elongated and shrunk with every bump which creates a jello or wobble effect. It's where this becomes surreal. Using a stabilization filter in iMovie (before bringing the footage back into FCP for editing) made everything blurrier. When I exported the h.264 timeline as is in a high quality this strange stop-motion effect was created. When I first converted the timeline to ProRes before exporting at best quality, it becomes a smoother forward motion, but with a lot of jitters. Maybe in the future (when that stupid construction is gone) I will experiment with the GoPro further and try the chest mount or other frame rates.